Have you ever encountered “Scope Creep”? You know what I mean, You will have heard Project Managers complain about “Scope Creep”, Scope creep is when the “To-Do list” keeps growing, especially when it grows faster than we are completing the tasks. I expect we can all agree that projects work better when: we know what we need to achieve, the scope is fixed, we are not being given extra things to do and the Project Manager and team are not constantly having argue against “things being added”. A clear project scope is one way of combating scope creep. I have seen the start of a lot of projects! Everyone wants to get a project off to a good start, but Analysis and Requirements projects are notoriously difficult to define. We all want to get started, we know we need a clear definition, but we don’t want to get bogged down in endless discussions about exactly what is included and what isn’t. I’ve written a course which teaches a technique I have used to define the boundaries of all sorts of things. I’ve used it as an individual, with a team and with larger groups. I have found it useful. I think you will too. An analysis project may not start with clear boundaries. If “A clear scope makes for a sound project”, how do we define that scope without performing the analysis? This course shows you how to do just that! I teach using a mixture of lectures and exercises. You will learn by seeing, hearing and doing. With each step you build your knowledge using what you have learned already. An on-line course sets you free to work at your own pace and to review and revisit earlier material, even after you have completed the course. Scope Workshop Course – 50% Off! Do you deal with problems in your working life? If you work in IT (Information Technology), then I am almost certain that you do! “Problem Determination” is the art of identifying where the cause of a problem can be found in a system, so that it can be fixed. I like to call it “bug hunting”. Having a reputation for being able to track down the causes of problems will make you more valued. Being able to perform Problem Determination efficiently, or manage others doing Problem Determination will enhance your reputation. I’ve written a course which teaches you a simple 8-step framework which can be used to manage the Problem Determination process, and techniques which will enable you to isolate problems efficiently. As you complete the sections what you have learned is reinforced by a case study and you can check your understanding using quizzes. Problems are inevitable. Dealing with problems can be stressful. Take this course and you will learn how to track down problems efficiently and reduce that stress. Whether you work on a help-desk, or as a developer, analyst or manager the skills you learn from this course will make you more effective. Problem Determination is a powerful intellectual skill which anyone with an analytical and practical mind can learn. It is a skill which once learned can be carried with you and applied to different systems and in different industries. 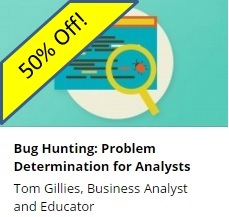 Bug Hunting – 50% Off! 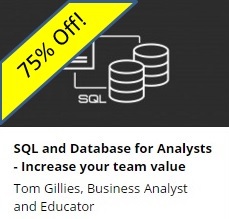 Author Tom GilliesPosted on 2015-11-13 2016-08-26 Categories Courses, SQL, SQL-Courses, UncategorizedTags Course, SQLLeave a comment on Why bother learning SQL?